Ever since I started reading Propliner magazine, I noticed the regular contributions by Sean Keating. When I travelled through Western Canada we had a chance to meet, and I made good use of his tips on what to visit in the area. 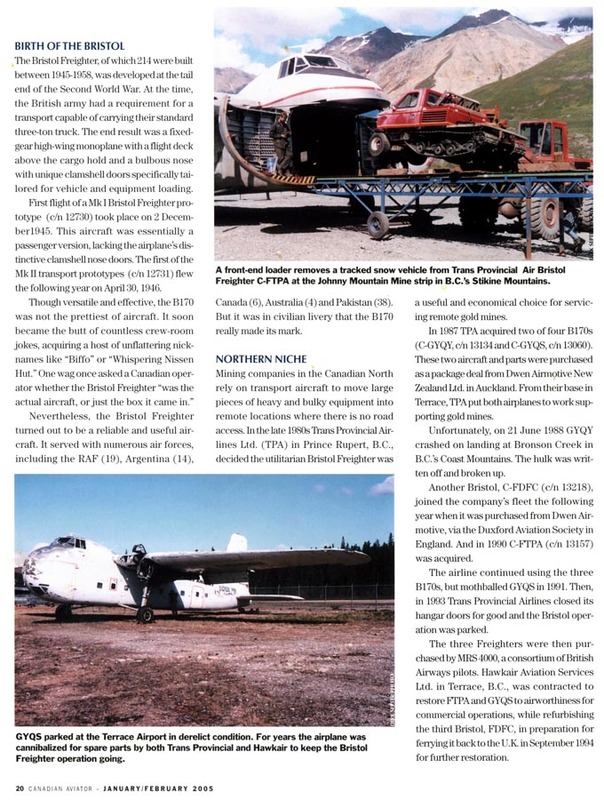 When I had completed my Western Canada 2006 report, with a detailed report on the Canadian Museum of Flight (at Langley,B.C. 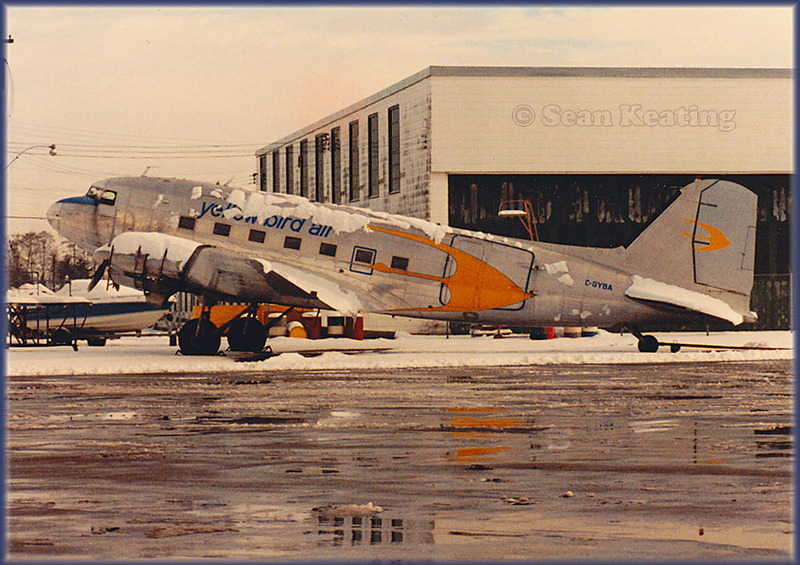 ), Sean noticed my photos of DC-3 CF-PWH, for which preservation he had played a role in restoring and transporting this DC-3 to the museum! I am grateful for his photos and a personal report. In time , Sean sent some more photos, but maybe not as much as I would have liked! 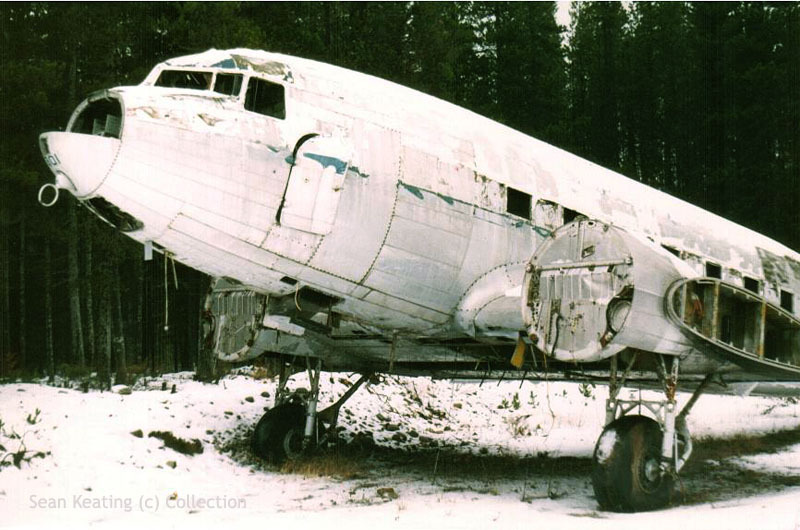 Douglas C-49H CF-PWH (c/n 2198) is seen here at Terrace,BC... considering a restoration for preservation and museum display, looking like this, seems quite a challenge! 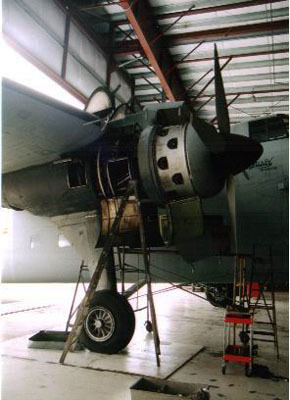 Things worked out fine, as can be seen on my report about a visit I undertook to the Canadian Museum of Flight at Langley,B.C. 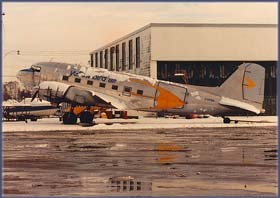 in 2006 where CF-PWH is preserved in exquisite condition and is now the oldest surviving DC-3 in Canada! 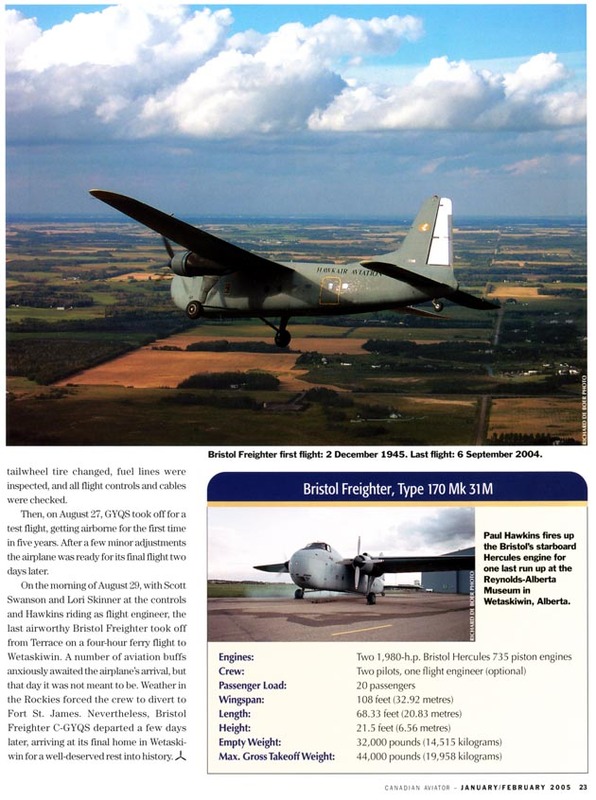 History of PWH can also be found on the link above.
" 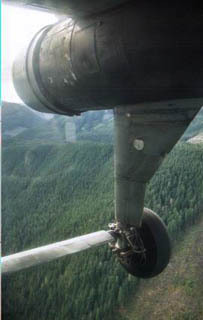 I was crew chief on the recovery of DC3 CF-PWH from Terrace to Cloverdale in ’87, when I was part of the Friends of the DC3 Canada -chapter. Ssome of the members continued on with the restoration when it got to Langley. 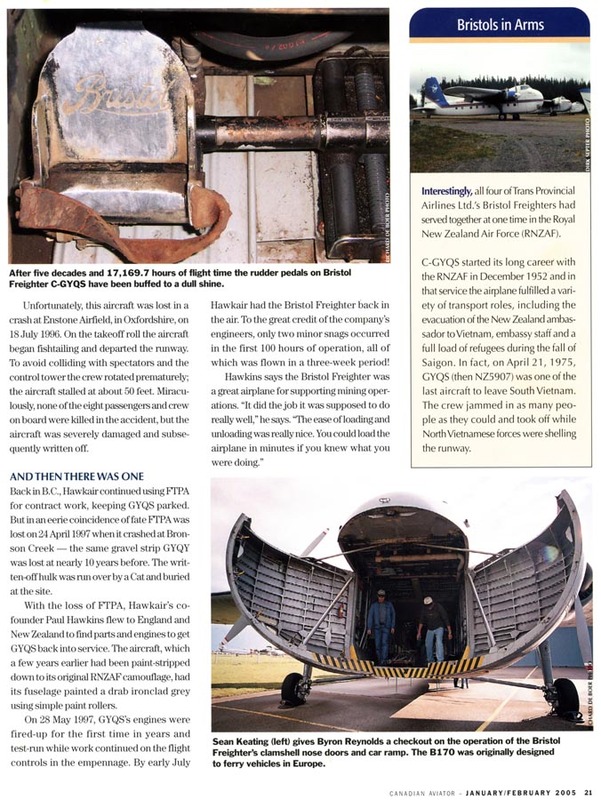 It was then donated to the Museum of Flight, when the chapter disbanded (that was a few years ago, not sure which date, maybe 1997/98??)." 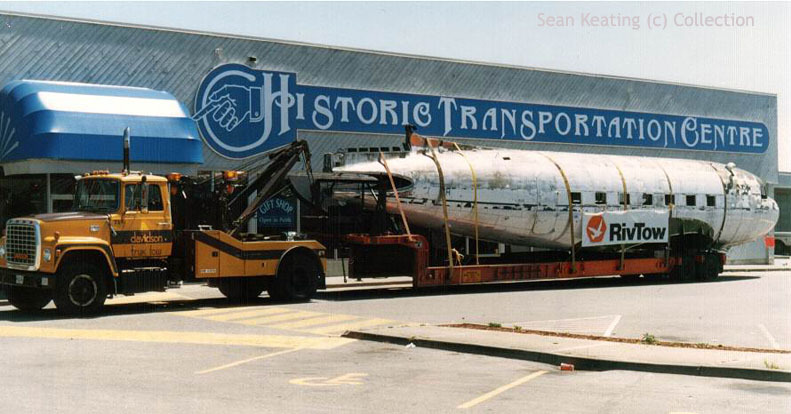 June 1987: CF-PWH is carefully hoisted on a trailer. 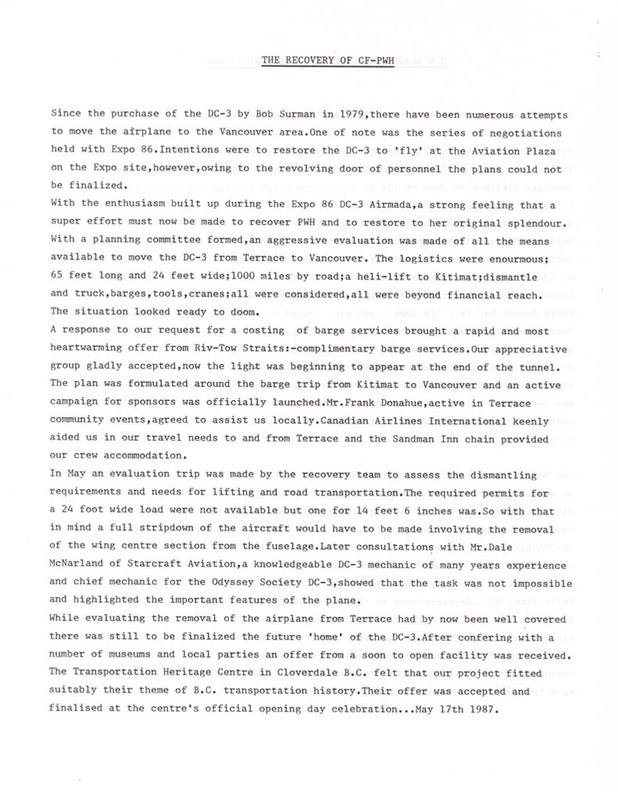 Here is the text Sean wrote on this recovery project many years ago, it is in jpeg format; recovery, page 1 and recovery, page 2. 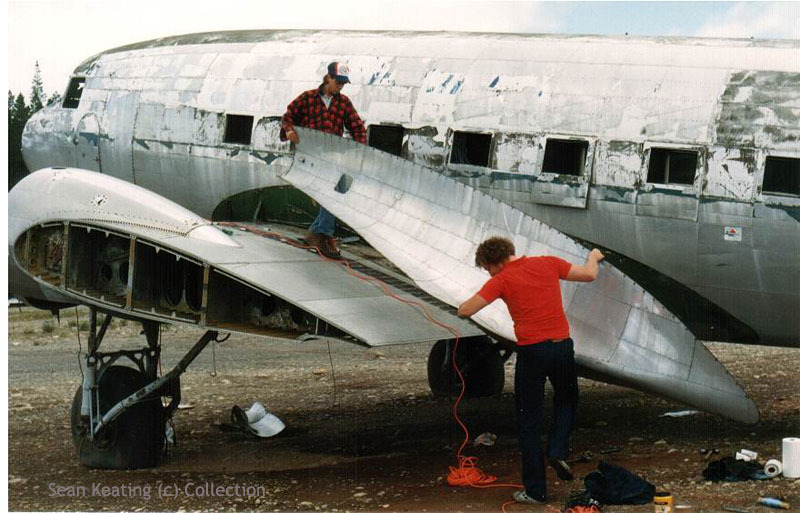 Cloverdale aug87: reassembly can start ! 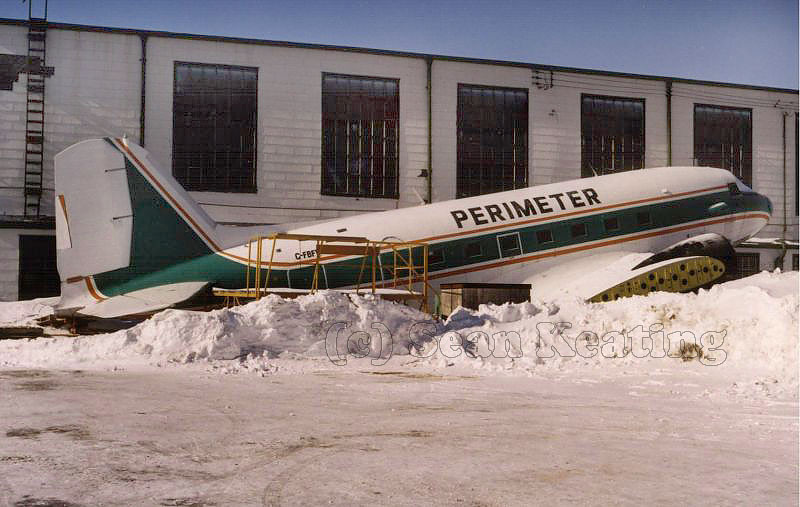 "I remember Sean's DC-3 at the Terrace airport quite well as it sat there for many years. 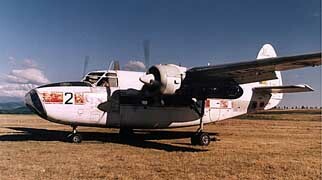 The aircraft was built in 1940 as c/n 2918. 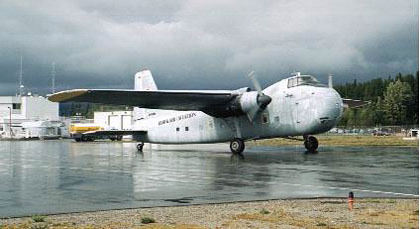 Named "Flag Ship of Texas" and flew for the American Airlines until the start of WW II when it was recruited for service into the U.S. Air Force. After the war, it was returned to the manufacturer. 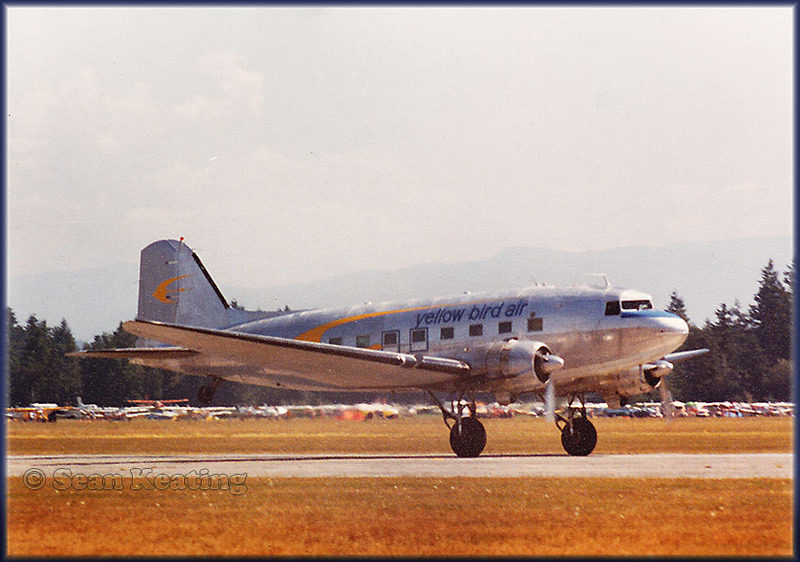 It was kept in the corporate fleet until it was sold to Queen Charlotte Airlines in 1953.For the next 20 years, the DC-3 served communities throughout nortwestern British Columbia. 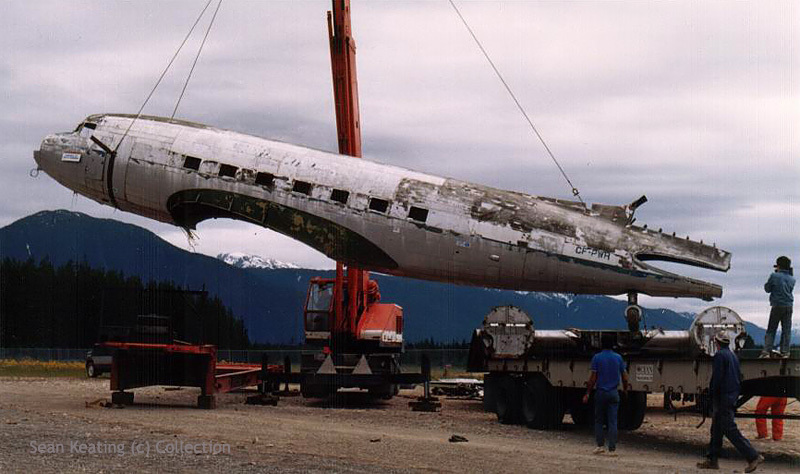 In 1973, it narrowly avoided being cut up for scrap metal.The salvagers litterally had blow torch in hand when the Kitimat Lions Club came up with the money to save the aircraft after they had become aware of its historical value. 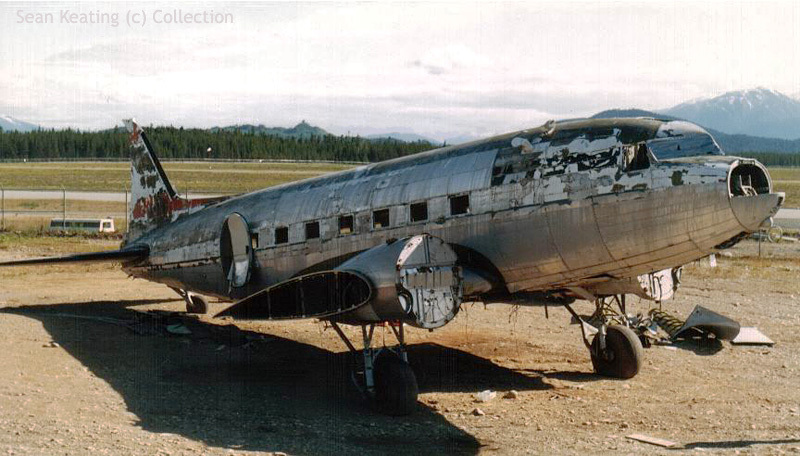 But there was never any money to restore the aircraft and it just sat there and deteriorated until the Friends of the DC-3 Society finally came to its rescue in 1987." 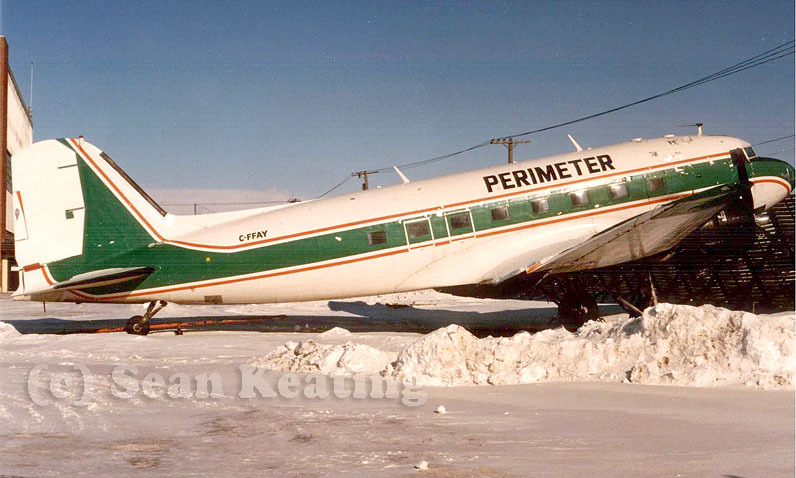 More on this unique propliner can be read on my 2006 Reynolds Transportation Museum page; these photos by Sean recall the days of getting C-GYQS back in the air and its departure from Hawkair's base, Terrace,BC. 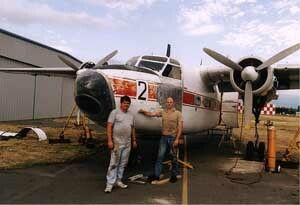 This photo shows no.2 engine under maintenance, since the Bristol Freighter had not flown in 2 years. 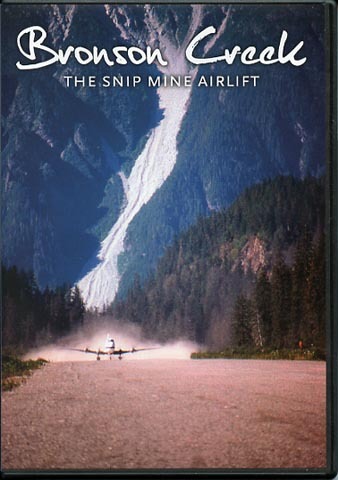 An excellent DVD was released by Avion Videos in 2008, showing Hawk Air's 'Biffo' and Carvair in operations during the Bronson Creek / Snip Mine Airlift. Excellent footage !!! 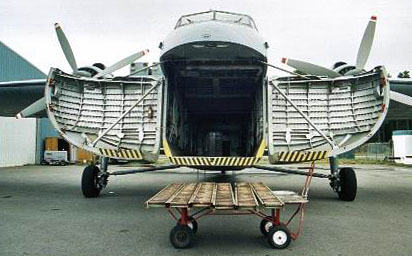 The unique clamshell cargodoors of the Bristol Freighter. Ideally suited to drive your car into that gaping cavity.. 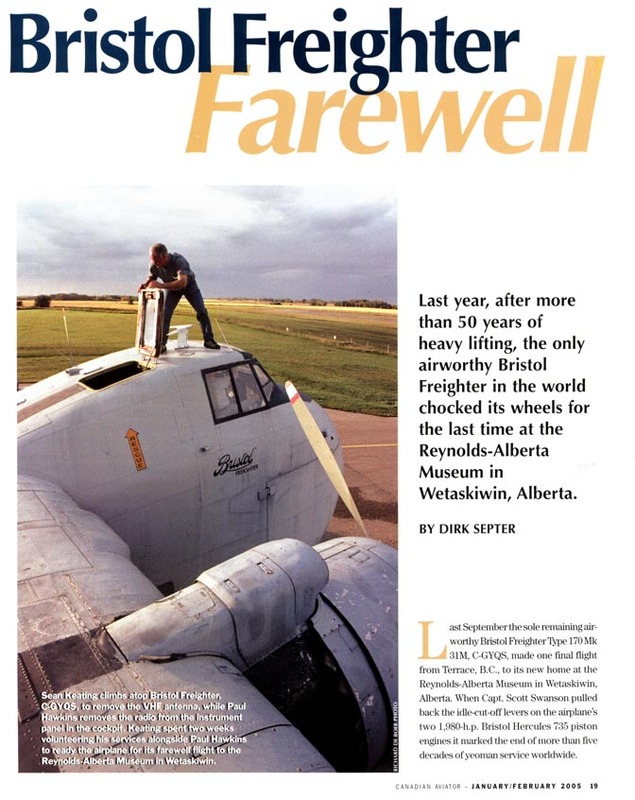 The flight continued on 06Sep04 and C-GYQS arrived after 02hr50 at wetaskiwin,ALB. 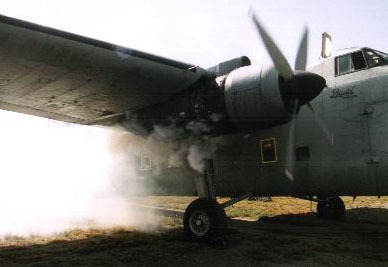 He is seen here opening the cockpit hatch whilst the crew complete their last ever (?) 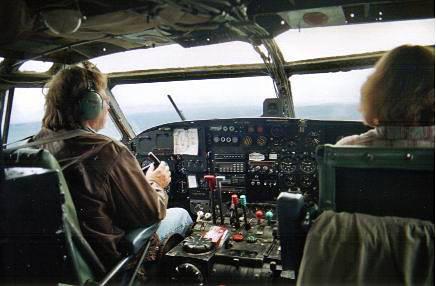 shut down checklist in the cockpit, following the arrival at Wetaskiwin on 06Sep04. 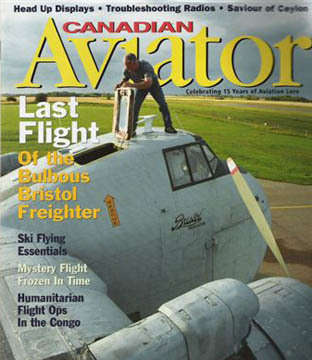 Sean Keating wrote an extensive article about C-GYQS and this trip, "The Last Bristol Bows Out", in Propliner Magazine's 100th issue (published Autumn 2004). 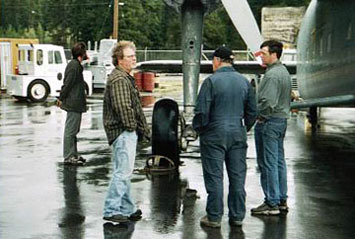 The photo shows (owner) Rick Barter on the left and Sean on the right. 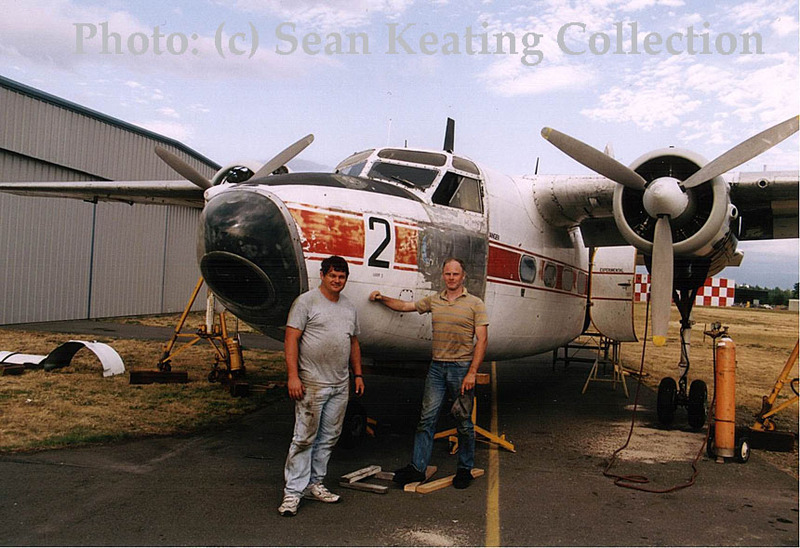 Sean wrote: "we nearly got it to fly, just ran out of time and money… which are the two ingredients that make all old propliners fly .."
Both were parked adjacent to the Perimeter hangar. 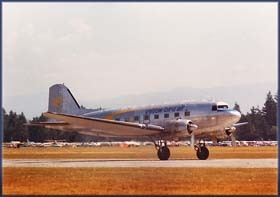 C-FFAY is Douglas C-47 c/n 4785; I came across C-FFAY in 2006, stored with Buffalo at Red Deer. 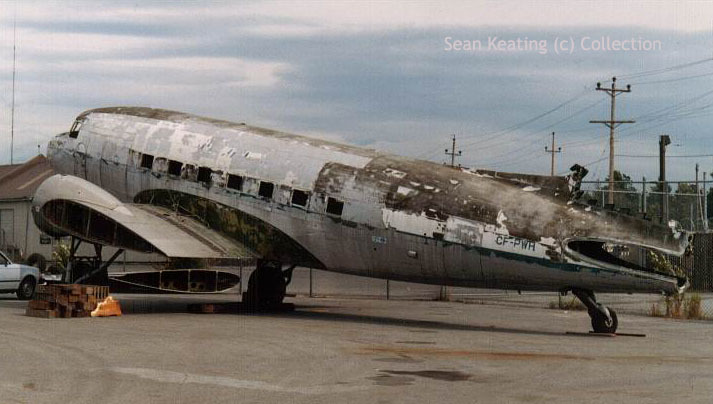 "I got a call from Glen Etchells, one of our local YVR experts; he photographed 'YBA on 15th March 1980 in exactly the same place and paint condition as your photo.. 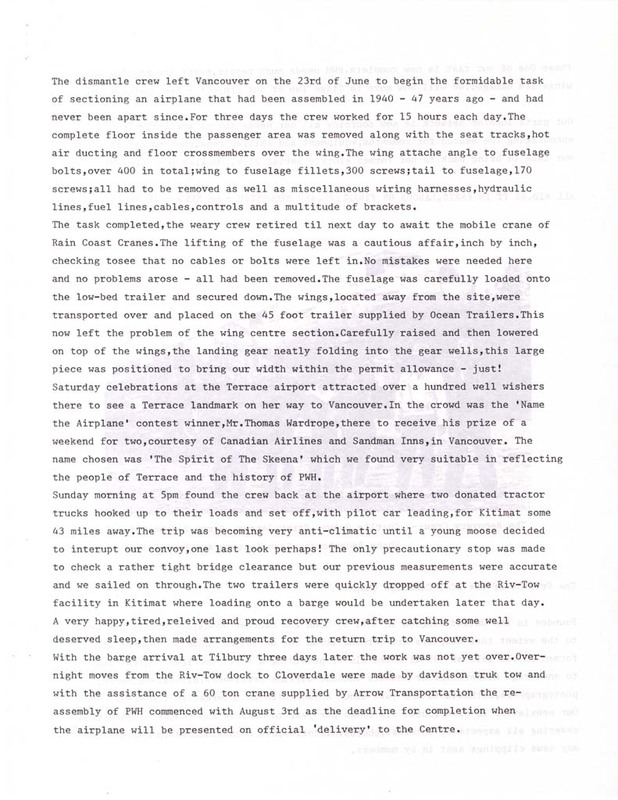 He commented that the paint stripping was halted for a period of about two to three months, but in May 1980 he saw it fully polished with new titles. 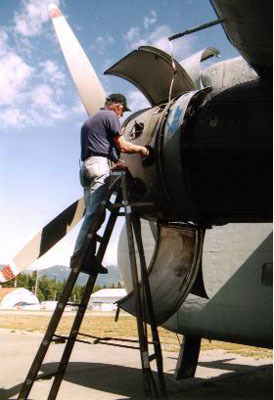 The paint stripping was done by our friend Tyler who earned his living on many ramps in YVR cleaning and supporting commuter aircraft and bizjets. Given the level of inactivity of 'YBA, and the amount of snow on the mountains, it would be assumed that your photo was taken in that same time period, if not on the same day! 1. Vancouver in the winter, January 1982, 'YBA spent a lot of time here at the old Innotech ramp. 2. 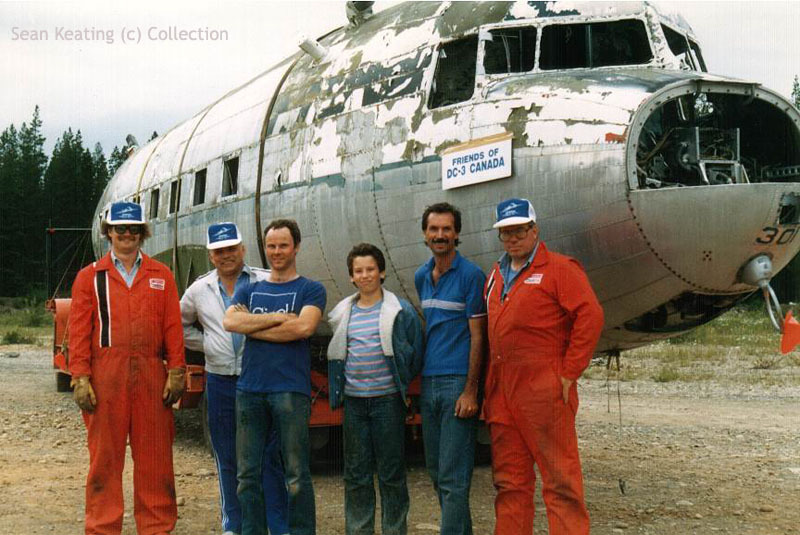 Abbotsford Air Show, Aug 1980. I think 'YBA was taking up the skydivers to open the show. " Sean wrote me in response to a visit to Mason Airfield,NH in Oct.09 where I photographed N33623, which used to be C-GYBA.